Whether acting as buyer (grantee) or seller (grantor) in a real estate transaction, a review of the state's property laws is always a good starting point. Alaska Stat. Title 34 (2102) holds most of the statutory rules governing real estate deeds. Most states, including Alaska, share certain requirements for real estate deeds. Conveyances of estates or interests in land must be in writing and bear the signature of the owner or an authorized representative, the owner must be at least eighteen (18) years old, and it must be acknowledged and recorded. In a deed or conveyance of the family home or homestead by a married man or a married woman, both spouses must be named on and sign the deed, regardless of whether or not they share a proprietary right, title, or interest in the property (AS 34.15.010). Title 34 contains the forms of warranty and quitclaim deeds, making it possible to define additional requirements. A valid deed must include the name and address of the grantor; the amount and/or type of consideration paid for the real property; the grantee's name and marital status; the legal description of the land as shown on the previous deed or current survey; and the signing (execution) date (AS 34.15.030(a)), (AS 34.15.110(b)). In addition, deeds conveying co-owners must include a comment about the way they wish to hold title to the property (vesting). Alaska law allows two primary methods of co-ownership of real estate: tenancy in common and tenancy by the entireties. Tenancy in common is the default status (AS 34.15.110(a)). When one tenant-in-common dies, that interest reverts to the deceased's estate. Tenancy by the entireties is only available to married couples and includes the right of survivorship, which means that if one spouse dies, the other gains full ownership of the property by function of law and without the need for probate. The decision to vest as tenants by the entireties must be explicitly set out in the deed. For example: "BB conveys to CC and DC, a married couple, as tenants by the entireties with rights of survivorship, and not as tenants in common" (AS 34.15.110(b)). Warranty deeds must contain specific wording, "A conveys and warrants to B," that forms a shorthand for the binding covenants of title between the grantor and the grantee. The covenants, as set forth in AS 34.15.030(b), confirm that the deed "is considered a conveyance in fee simple to the grantee and the heirs and assigns of the grantee, with the following covenants by the grantor: (1) that at the time of the making and delivery of the deed the grantor is lawfully seized of an indefeasible estate in fee simple to the premises described, and has the right and power to convey the premises; (2) that at the time of making and delivery of the deed the premises are free from encumbrances; and (3) that the grantor warrants the quiet and peaceable possession of the premises, and will defend the title to the premises against all persons claiming the premises." Unlike warranty deeds, quitclaim deeds do not contain covenants of title. They do, however, contain specific language, "A conveys and quitclaims to B, all interest which I (we) have, if any." In much the same way as the terms in the line transferring interest in a warranty deed act as shorthand for the guarantees contained within, the language in a quitclaim deed is "considered a sufficient conveyance, release and quitclaim to the grantee and the heirs and assigns of the grantee, in fee of all the existing legal and equitable rights of the grantor in the premises described in the deed" (AS 34.15.040). 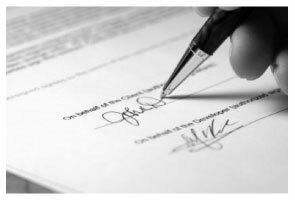 After selecting the correct form of deed and verifying the required information, sign it in the presence of a notary or other individual with the power to administer oaths (AS 34.15.150). *	The form and all writing must be clearly legible, and capable of being copied. *	The document's title must identify its purpose. For example, "Warranty Deed" or "Quitclaim Deed"
*	Prior recording information: a book and page number or document ID if the document amends, corrects, extends, modifies, assigns, or releases a document previously recorded in Alaska. *	A name and return address that identifies where to send the deed after it's recorded. *	Deeds must contain mailing addresses for every named grantor and grantee. *	Identify which recording district is responsible for recording the document. *	Payment in full of all taxes and fees. *	Contact the local recorder to ensure correct document formatting, as the local requirements may vary from district to district. Alaska follows a race-notice recording statute. So, from the time a deed enters the records of the recording district local to the real property, the recorded document serves as constructive notice to subsequent purchasers of the same property. Further, a conveyance of real property in Alaska is void as against a subsequent bona fide purchaser (someone who, in good faith paid valuable consideration, usually money) of the property whose conveyance is recorded first. "An unrecorded conveyance is valid as between the parties to it and as against one who has actual notice of it." To simplify this rule, between two unrecorded deeds, the first in time has priority until and unless the second in time records. For example: A conveys to B, a bona fide purchaser who does not record the deed. Even though B fails to record, the A to B conveyance is valid. Later, A conveys the same land to C, another bona fide purchaser, who records the deed immediately. At that point, B loses all rights to the property and C is the lawful owner. Until C records, though, B still owns the property because that deed was executed first (AS 40.17.080). By withholding the deed from public notice, B does not appear in the chain of title (ownership history) for the property. Because the time of recording might matter in an ownership dispute, the recorder is obligated to mark each document with a serial number and the date, hour, and minute of recording (AS 40.17.070).